Shop from now until July 17, 2016 at Teavana Canada online and get 20% discount on almost everything. 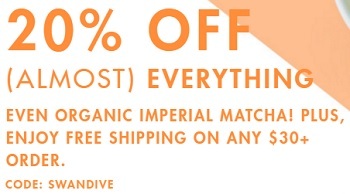 You can receive this offer by entering promo code SWANDIVE at checkout. Plus, receive a free shipping on any order of $30 or more. Official source of the information is Teavana Canada. Offer is valid through July 17, 2016. For more information about the promotion visit Teavana Canada online.